F1 = 50% Golden Retriever and 50% Poodle. 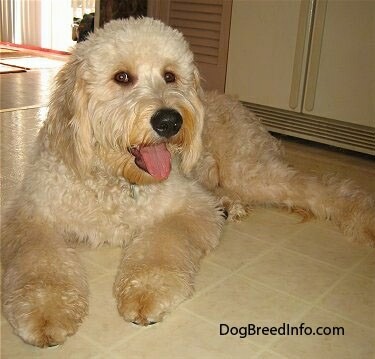 This is Golden to Poodle cross; this is first generation, resulting in healthier offspring. 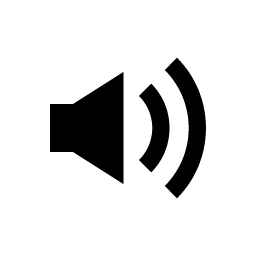 Hair type can be smooth like a Golden, or wavy/shaggy or occasionally a wiry look like an Irish Wolfhound (but with a softer feel), they can shed or not shed, pups in the same litter can vary. F1-B = 25% Golden Retriever and 75% Poodle (F1 Goldendoodle and Poodle cross). 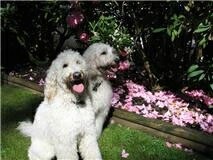 This is Goldendoodle bred back to Poodle. 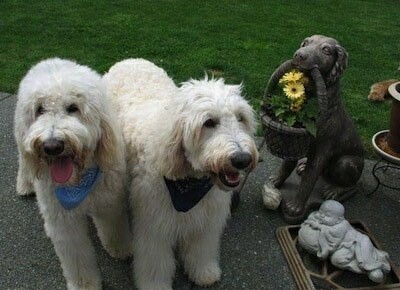 F2 = F1 Goldendoodle and F1 Goldendoodle cross. 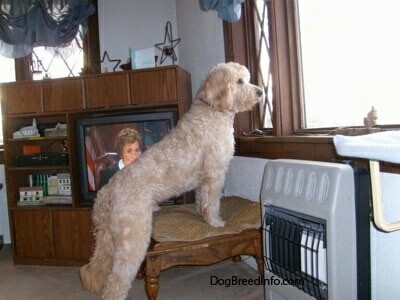 With this combination you get the same percentage of Golden and Poodle mix as you would with an F1 Goldendoodle. 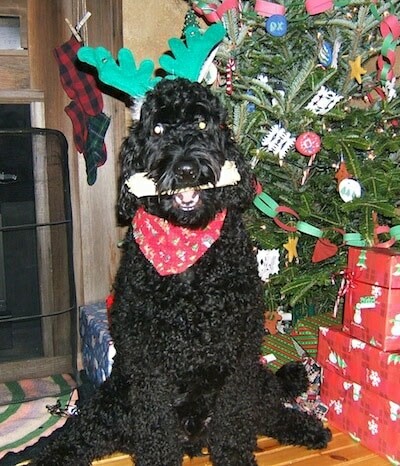 "I took this photo of Amos, our black Goldendoodle two days before Christmas. He is the favorite dog by all who know him. He is such a loving and pleasing dog, he loves to snuggle on the couch and occasionally when the mood strikes play ball. Everywhere we go he must go too. We live on nearly two acres of land so he gets plenty of exercise. He loves to play dress up and wears all types of clothing. He is absolutely wonderful with our kids and allows them to do whatever they want to him." "This is our adorable little boy Deek Dexter Doodle. 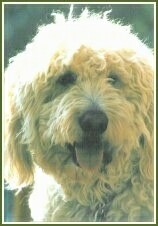 He is an ultra-cream Goldendoodle. He is pure joy. He is 10 months in this picture and stands around 24 inches high from the ground to the top of the shoulders, and weighs about 65 lbs. 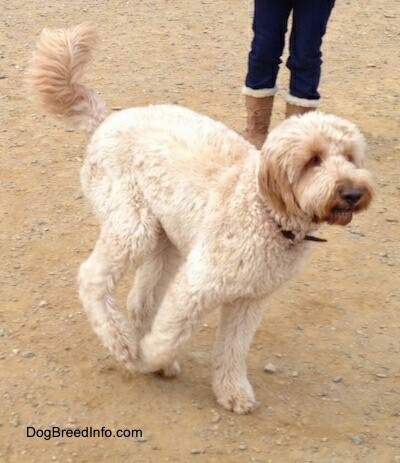 The Goldendoodle is a Golden Retriever / Standard Poodle cross, but being an F1b generation, he is a backcross so his dad was the actual Goldendoodle and his mom was a Standard Poodle, thus being non-shedding and non-allergenic. We got him from Cream of the Crop Goldendoodles & Poodles. Doodles are fun-loving and very curious. He loves to get his morning snuggles from Mommy and Daddy and then go for his big run. There is never a dull moment around the house. He is so adorable. He is also a very good boat dog. He loves the beaches and finding sticks. He loves the rain. He is a very good runner and plays well with all his toys. He is very gentle and not aggressive at all. We love our Deekdawg!!" 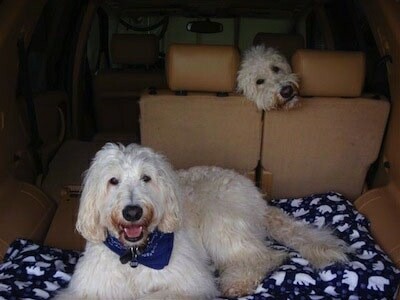 "Deek Dexter Doodle at 4 years old and his brother Finnigan!! They are the sweetest guys. They love each other and play well together. They are very photogenic, too. 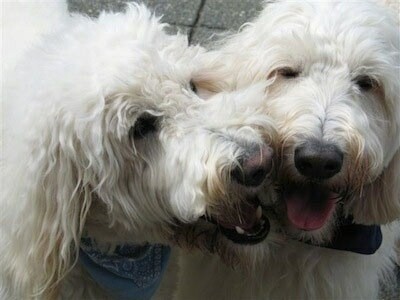 We could not have asked for a better dog breed than the Doodle. They are so much fun!!"